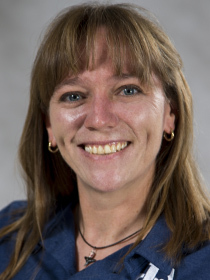 Sarah Sloane serves as a member of the full-time faculty at Trinidad State Junior College, teaching courses in both the Criminal Justice and Physical Education departments. Sarah also serves as our lead instructor, on the Trinidad campus, for both of the aforementioned disciplines. Sarah has been a member of the full-time faculty since 2012, but joined the Trinidad State team in 2010 as an assistant softball coach. At present Sarah sits on the curriculum committee, and student emergency affairs committee. She’s also a member of the booster club and faculty senate. Sarah’s professional memberships include Alpha Phi Sigma, The Academy of Criminal Justice Sciences, and The Colorado Association of Career and Technical Education. Prior to her career in higher education, Sarah worked for mTuitive Inc. a software firm that specializes in synoptic reporting and healthcare informatics. Sarah, along with industry experts in human factors and medicine, created xPert for Pathology, a CAP compliant workstation for surgical pathologists. In addition, Sarah spent several years as a member of State Farm’s National Catastrophe Team where she travelled throughout the United States helping policyholders recovered from various natural disasters. During this time Sarah taught courses on insurance policy, served as a team manager and an arbitration representative, routinely handling multimillion dollar claims. Prior to her employment in disaster response, Sarah worked in State Farm’s Special Investigation Unit, where she examined and serviced claims suspected of being fraudulent. Sarah Sloane holds a BA in Criminal Justice from Franklin Pierce University, a Master’s in Criminal Justice from the University of Colorado at Colorado Springs, and an MA in Human Performance and Physical Education from Adams State University. She is also a licensed helicopter pilot. Her research interests include intimate partner violence and the school to prison pipeline.